There is no need to remind you of what happened with Samsung’s Galaxy Note 7 smartphones last year, as their flammability, due to faulty batteries, still hits headlines and is subject of anecdotes to this day. Well, last week was kind of a reminder itself, as the Korean tech giant launched the Galaxy Note Fan Edition, effectively re-offering the Note 7 in a slightly revamped, but apparently safer build. 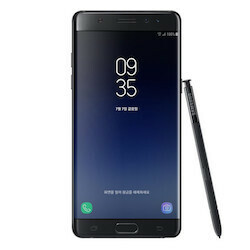 We wrote about what sets the Note FE apart from its problematic predecessor at first sight, taking note of the omitted Samsung logo under the earpiece, the integrated Bixby support and Samsung Experience UI, the upgrade to Snapdragon 821 from 820 in the original Note 7, as well as, yes – the new battery. To be honest, given the model’s history, we were mostly intrigued by the last change, as it was the pivotal point that turned Samsung’s Note 7 into a massive fiasco, after many reports of exploding battery units. A recent teardown of the FE device by iFixit has given us a closer look into what’s under the back panel of the phone and what the new battery is like. The 3500mAh piece in last year’s Note 7, like we told you before, has been substituted for a 9% smaller, safer 3200mAh unit in the FE. Compared to the old one, the new battery is 2.3 grams lighter, weighing at 45.4 grams. The 3200mAh piece also features smaller dimensions, measuring at 37.4mm x 97.2mm x ~5mm. Just for comparison, the flammable 3500mAh unit measured at 37.9mm x 97.8mm x 4.9mm. The teardown comparison involved only one sample of each battery – one old, one new – and cannot be said to prove conclusively or finally whether the newer battery is indeed safer. It’s worth saying that the new battery has passed Samsung’s 8-point safety checks and should stay flame-free. But we guess that this is something only time can tell for sure. Even though the Note FE is intended for the Korean market only, it will be more than interesting to follow up on the battery upgrade, as the original Galaxy Note 7 is something that will be remembered for a long time, not just in Korea, but around the globe. The new and old batteries are pretty much similar in size, but the smaller performed better at risk tests. Image credits to iFixit. Why is this priced like the U11? This is a refurbished device with last years specs lol. It's not necessarily a refurbished device, it's using new parts, including a new battery and CPU. Plus, even with last year's specs, it's still far more capable than any device running on bare bones stock android. So, it's well worth the price, but will only go for it if the Note 8 dissapoints, and by that time, its price would have dropped even more. No, it isn't refurbished. It was made with components already delivered but not used due to the recall and discontinuation of the Note 7. If it were refurbished, there will be over 2 million units available for purchase not just 400,000 units. Though, I agree that it is overpriced given the history of the brand. Maximum 350USD in my opinion. A year old new phone is only worth $350? Yeah well good thing its only your opinion. Given the history of the brand? What history specifically? What ruins it is the Snapdragon chip. They should have put the Exynos 8890. Hopefully if they launch it globally they'll have an Exynos variant. How does the SD ruin it exactly? We already knew it had a smaller battery. How is this news! ?